Beach Volleyball's World Tour is making a stop in the Russian capital this week. The Moscow venue is just one of 18 worldwide sites on the competition calendar this year, but is considered among the best. 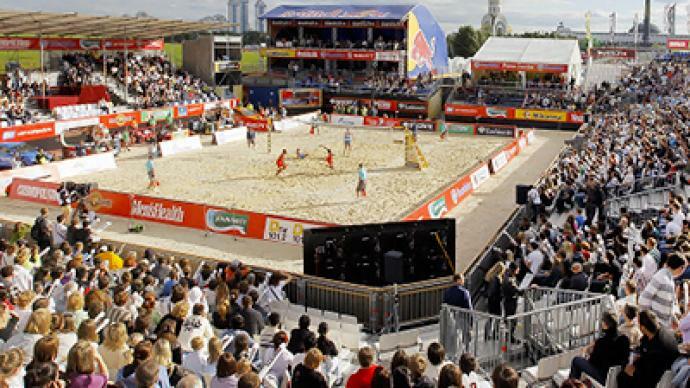 ­It is just the fourth time Moscow is hosting the beach volleyball grand slam. However it has already become one of the top stops on the world tour, with a prize fund of $600.000. Organizers on the Russian side have been virtually unchanged from the tournaments inception, perhaps that is the reason this event continues to evolve and attract the world's top talents. “We have a better location and we have a better venue. We have four courts, which are more visible for spectators and better for the players,” Ilya Volodarsky, the tournament’s director, said. While Russian players, both men and women, are still considered up-and-coming in beach volleyball circles, exposure to the gurus of this sport on home sand plays to their advantage in terms of gaining invaluable experience. Plus, no matter how the locals perform in the qualification rounds, Russians will be represented in the group stages by three men's and as many women's teams. Of course that is one luxury of a host nation that competitors from other countries do not enjoy. Team Netherlands took full advantage of the opening stage though, by adding three pairs to the next round. “This is my fourth time in Moscow. I’ve also been to Kazan and to Sochi twice. And I think Moscow is, of course, the prettiest city. I like it. We have a new set-up of the courts – more close to each other. In every tournament you see development every year and they grow as an organization. I like it here and the weather is perfect,” the Netherland’s Marloes Wesselink said. “The level of competition here is very high. It’s pre-Olympic season, so everyone wants to be at their top,” Wesselink’s partner, Madelein Meppelink, added. The Beach Volleyball World Tour action will last until the end of the week with the women's finals taking place on Saturday and men's on Sunday.